You just launched your new business, congrats! But, now what? Where do you start? Without any customers or clients, you can't make any money. I know, because I've been there. When I started my blog, it took me a little over two months to score my first paid advertiser. Getting your first customer takes time, patience, and dedication, but if you work on your marketing a little bit each day — you will soon see the rewards of your marketing efforts. Here are some easy marketing methods to get more business. 1. Start with Family, Friends, and Old Coworkers. Whether you’re starting a blog, selling products for a direct sales company, or launching a new virtual assistant business — start off by telling your family, friends, and past employers and ask them to spread the word. These people not only know and like you, but they can also vouch for your work ethic. These individuals want to see you succeed, so often they are more than willing to spread the word and make referrals. 2. Get Yourself a Website. 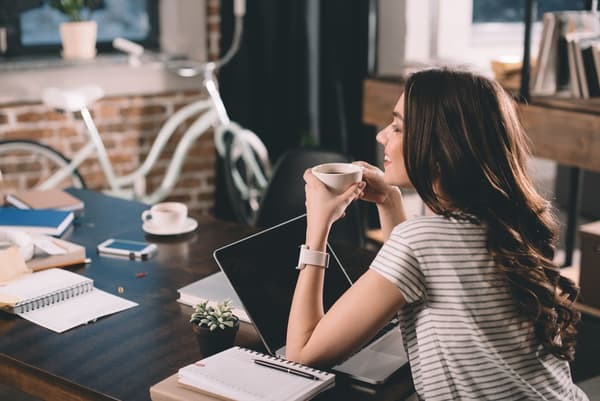 No business, regardless of its size, should be without a website, and this is especially true for home-based businesses, where your site may be the only impression you ever get to make with potential customers. Your website gives individuals a place to view your products and service, but also your references, testimonials, background skills and education, company values, and policies before deciding if they want to work with you. If you don’t have a website for clients to preview, they may pass you up and find another person who does. If you're working on a shoestring budget — here's an easy and affordable and easy way to get a website. 3. Networking Online and In-Person. Start networking both online and off. Start by choosing one local networking event to attend each month, and make it a goal to authentically connect with two people at the event. It's not about how many business cards you can pass out, but the quality of the connections you make. While one individual may not need your services or product, they may know of someone who does, and because you've laid the foundation for a relationship, they are happy to spread the word. If you're not sure where to look for networking events, try searching Facebook, Meetup, or your local chamber of commerce. You should also join a few social networks. Facebook is usually a given since it is the largest and most widely used, then figure out where your target audience is hanging out. Is it LinkedIn, Twitter, Instagram, Snapchat, or Pinterest? Once you've chosen your platforms, take time each day to build and cultivate new relationships, share your blog posts, and relevant information and articles. Having an online presence is not only an excellent way to market your business, but it also builds trust and credibility. On your website, you need to have an area where clients can sign up for your newsletter. Social media and search engine algorithms change constantly, and what drives traffic to your site one day, can be gone the next. With email marketing, you own and control your list. When you send potential clients valuable information on a regular basis, they will constantly be reminded of the services and products that you offer. Remember to ask people for their permission before signing them up for your newsletter – when you sign people up without their permission, it’s called SPAM. There are tons of affordable email marketing companies that can help you set this up, here are just a few to get you started: Constant Contact, Sendinblue, and ConvertKit. Not sure how to get started with email marketing? Here are 8 bite-sized tips to learn email marketing. Have you heard of a little old site called, YouTube? YouTube is the world's largest online video sharing site, and it is the second most popular website on the web according to Alexa. Video marketing is huge, and you can easily tap into this goldmine of customers for free. Create a video clip; maybe you demonstrate how your product works, perhaps you showcase a before and after profile or offer tips for staying organized – the possibilities are endless. Upload your video to YouTube for free, and then embed the video on your blog or website and share it on your social media channels. People love free stuff and what better way to get the word out about your product or service than by sponsoring a giveaway or providing a blogger with a free product for review! This is great publicity for you; simply contact the blog publisher, magazine editor, or TV producers about reviewing your product or featuring a giveaway and see new leads roll in. According to Rand Fishkin, “Blogs build familiarity and positive branding, and if I remember my business school training, the cardinal rule was – people do business with you because they know you, like you and they trust you – blogging accomplishes all three (and they show off your expertise in a subject)”. Just like a television series, blogs give customers and clients a reason to come back to your site – keep them curious and coming back for more. Not sure how to get started with blogging? Sign up for a free copy of my blogging e-book, which talks about writing killer content, getting traffic and monetization! Back in the day, paid advertising options consisted of a listing in the yellow pages, or maybe a radio, TV, or newspaper ad. Today online and social media advertising is where it is at, and best of all, it's much cheaper than the old school methods. Depending on your target audience, you may want to consider Facebook, Twitter, Pinterest, Instagram or Google ads, but it doesn't stop there, many blogs, websites, and newsletter publications have very affordable advertising rates as well. And don’t forget about online want ads like Craigslist. In fact, Craigslist is how I found my web programmer and virtual assistant. This form of advertising is sent out directly to prospective customers through the mail. For direct mail to work for you, first you will need to compile a targeted mailing list of potential clients. You can do this by purchasing a list from one of the many marketing agencies, like Direct Mail or Cactus Mailing. Next, you will need to create a persuasive letter or postcard that calls potential clients to action – you may want to hire a copywriter to write you some good, compelling copy. After you have these two items in place, you'll send out the mailing. I see a lot of realtors and restaurants that use direct mail marketing. 10. Create a Dream Client List. In Michelle Goodman’s book, “The Anti 9 to 5 Guide” she suggests creating a list of dream clients. Create a list of the 10 top people you wish you could work with and start approaching them about your business. Michelle says, “It may take a few months to land one of your dream clients, or it may take a few years. But the better connected you are to other mompreneurs and industry players, the greater your odds are of being in the right place at the right time”. How did you score your first client? 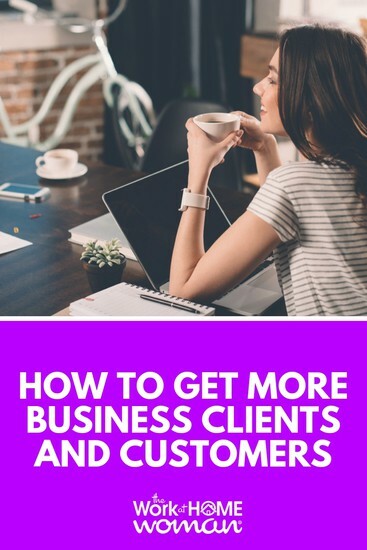 How do you get more business? We would love to hear from you! Originally published on January 15, 2010. Content updated on May 5, 2017. Relationship building is key – yes it takes time but the results will come. Really care about your potential business partners or customers, show you care and they will be attracted to you. There are so many messages out there and blatent advertising that you have to stand out from the crowd! Getting your business running is a work in progress. The things mentioned in this blog post is a big help. This has been so helpful and I look forward to trying some of the suggestions mentioned. I will stay in touch to let you know of my progress. This is a great site and thank you! This is such a great blog and some great information. Im just starting out and this helps alot. My blogg is gaining alot of traffic now and days and i am grateful for it. I been lookng for ways to bulid my RSS feed and followers. The blogging community is so willing and open to cross promote that they are a perfect place to network your way to increased business. Absolutely worth the extra time to develop those relationships. I totally agree and blogging is so much fun!